Rich Brown was born in Pittsburgh, Pennsylvania. In 1987, he earned a Bachelor of Science in Landscape Architecture degree from West Virginia University. 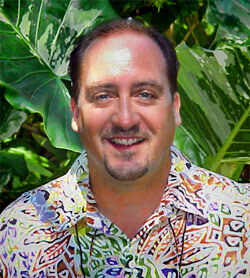 He moved to the Florida Keys to practice landscape architecture in 1987. Richard has been a Florida registered Landscape Architect since September of 1989, when he passed the Uniform National Exam and the Florida section (as required by the Florida Department of Business and Professional Regulation) to become a Registered Landscape Architect. We will provide you with the most professional, friendly, attentive, and artistically creative services available in the area, incorporating your style and personal tastes, as well as the architecture and conditions of your property along with current design trends and methodologies into the overall design. Richard's strengths are based on his knowledge of flora and the resource management of various ecosystems throughout the state of Florida and the Caribbean. His understanding of environmental issues and his ability to work with both state and local agencies--who regulate environmental laws in the state of Florida--is an invaluable asset to our clients. His ability to artistically and creatively design sites with environmental and cultural restrictions sets him apart from other designers. Presently, Richard is the President of the firm, Brown & Crebbin Design Studio, Inc., which is located on Plantation Key, in the upper Florida Keys. He is presently active with many groups, both county and state wide, including the Extension Overall Advisory Committee for Monroe County, the ASLA Legislative Subcommittee on Mangroves and the Ecosystem Management Committee for the South Florida Community-Urban Resources Partnership. Richard writes a monthly article on landscaping for a local newspaper, the Keynoter, as a contributing columnist. He is the past President of the Executive Association of the Florida Keys and an active member in the Ocean Reef Business Council, the Florida Native Plant Society, the Key Largo Garden Club and Fairchild Tropical Gardens. Over the years, Brown & Crebbin has been recognized and featured in many magazines and the media. Take a look at our featured projects to find out what makes a client of Brown & Crebbin stand out. Why hire a landscape architect? Find the answer to this question and understand more how we can help. When you're ready to get started, or if you have any questions, just call or send us an e-mail. Steven C. Crebbin passed away in February of 1999. Steven was a native Floridian, born and raised in Miami. Having grown up in South Florida, he was cognizant of the environmental concerns and issues that go hand-in-hand with coastal landscapes. 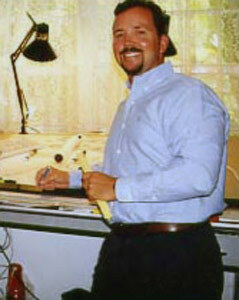 In 1991, he earned a Bachelor of Landscape Architecture degree from the University of Florida, in Gainesville. In honor of his achievements, friends and family have created the Steven C. Crebbin Endowed Scholarship Fund to provide support for students in the Department of Landscape Architecture at the University of Florida. Steven then worked on many projects throughout Dade and Monroe counties, as well as the Bahamas. Steven's strengths lay within his knowledge of basic design principles. He traveled far and abroad throughout his career, which enabled him to be exposed to various design themes and styles. His extensive European travel allowed him to study garden design in countries such as England, France and Italy. These influences were evident in his ability to reflect a design style from the architecture or context of any given project. He saw many formal and vernacular garden design styles and, most importantly, understood how these styles could be adapted to any given condition. Steven was the Vice President of the firm, Brown & Crebbin Design Studio, Inc.. In August 1997, he was appointed as a member of the Old Keys Bridges Task Force, by Governor Lawton Chiles. He was an active member in the Ocean Reef Business Council, Key Largo Chamber of Commerce, Key Largo and Marathon Key EDC Highway Beautification Subcommittees, Florida Keys Scenic Highway Steering Committee, the American Society of Landscape Architects, the Florida Native Plant Society, Fairchild Tropical Gardens, and The Viscayans.